Daikon radishes aren't harvested until late fall - one reason they're not especially spicy. If you've never met a daikon radish, you're in for a treat. They're an incredibly large radish, very thick and satiny white. While Americans generally associate them with Japan, they actually found their way to Japan via China about two thousand years ago, and they're incredibly popular all over Asia. They're also called mooli in Britain, and they're used in Asia in all sorts of dishes. They're particularly popular in the winter when they provide a much needed source of Vitamin C. And yes, you really can eat the greens. Read more about Daikon Radishes on Elspeth's blog. 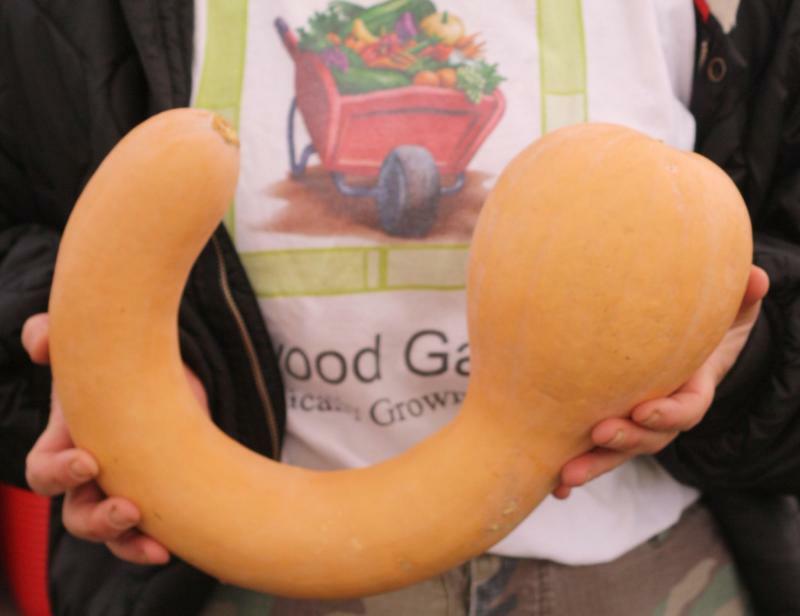 An interesting thing about Tromboncincos is that they can be used as both a summer or a winter squash. Right now, Darnell's selling them as winter squash—they look and taste like butternut, and they'll keep through the winter. At the West Tisbury Winter Farmers' Market on Martha's Vineyard, Elspeth discovers a local, all-beef hot dog. First off, Stephen, thank you for the apple cake. I knew it would be good—I could tell that much from the warmth and the smell and the soft, crackly apple bits that peeked out around the edges. But I had no idea how good—that it would melt and give way and taste downright heavenly. Find out more, and get the recipe for Old Truro Road Apple Cake, on Elspeth's blog, Diary of a Locavore.